Friday, January 30 – with Pete & Juan Escovedo Latin All-Stars at Angelica’s Bistro, Redwood City, CA. With Pete Escovedo – timbales; Juan Escovedo – congas; Ray Obiedo – guitar; David Belove – bass; and Phil Hawkins – drums. Music starts at 8:30 pm. Friday, April 10 – with Pete & Juan Escovedo Latin All-Stars at Angelica’s Bistro, Redwood City, CA. With Pete Escovedo – timbales; Juan Escovedo – congas; Ray Obiedo – guitar; David Belove – bass; and Phil Hawkins – drums. Music starts at 8:30 pm. 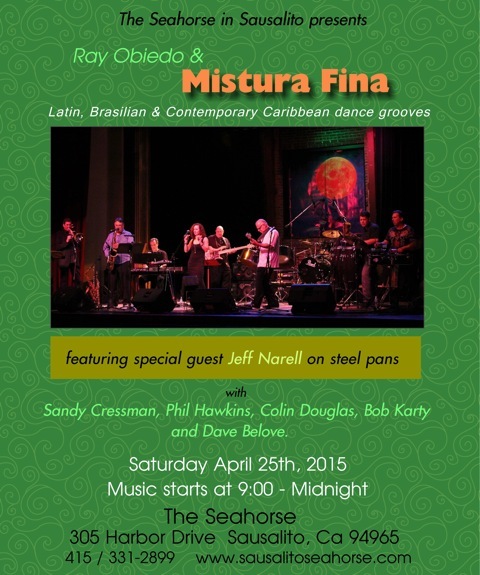 Saturday, April 25 – with Ray Obiedo & Mistura Fina at The Seahorse, Sausalito, CA. With Ray Obiedo – guitar; Sandy Cressman – voice; Jeff Narell – steel drums; David Belove – bass; Phil Hawkins – drums; Colin Douglas – percussion. Music starts at 9:00 pm. Saturday, May 2 – with Pete Escovedo and his Latin Jazz Orchestra at The Throckmorton Theatre, Mill Valley, CA. Music starts at 8:00 pm. 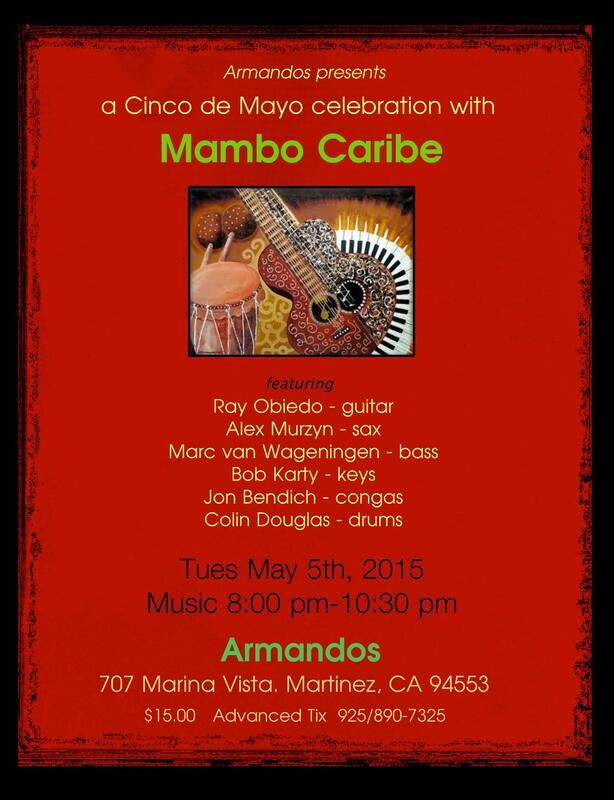 Tuesday, May 5 – with Ray Obiedo & Mambo Caribe at Armando’s, Martinez, CA. Brazilian and Latin jazz mixed with East Bay funk, featuring Ray Obiedo – guitar, Alex Murzyn – sax & flute, Marc Van Wageningen – bass, Jon Bendich – congas, and Colin Douglas – drums. Saturday, June 27 – with the Pete and Juan Escovedo Latin All-Stars at Angelica’s Bistro, Redwood City, CA. With Pete Escovedo – timbales; Juan Escovedo – congas; Roger Glenn – vibes, flute; Ray Obiedo – guitar; David Belove – bass; and Phil Hawkins – drums. Music starts at 8 pm. 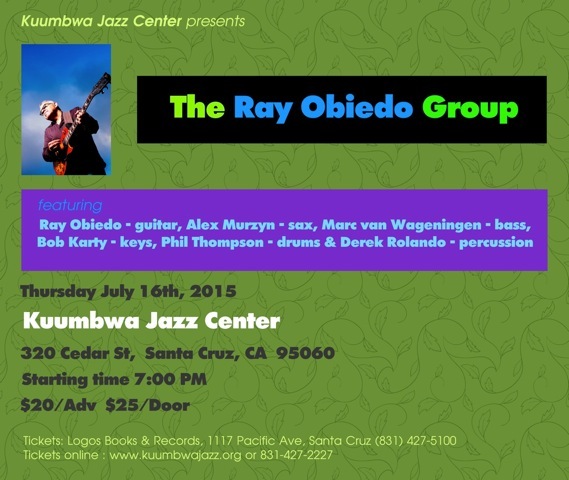 Thursday, July 16 – with the Ray Obiedo Group at Kuumbwa Jazz, Santa Cruz, CA. With Ray Obiedo – guitar; Alex Murzyn – saxes and flute; Marc Van Wageningen – bass; and Phil Thompson – drums; and Derek Rolando – percussion. Music starts at 7 pm. Sunday, July 19 – with the Peter Michael Escovedo All-Stars at Armando’s, Martinez, CA. Latin jazz, funk, and fusion featuring Peter Michael Escovedo – drums and percussion, Pete Escovedo – percussion, Ray Obiedo – guitar, Marc Van Wageningen – bass and Melecio Magdaluyo – saxes and flute. 4:00 pm. Friday, July 31 – with the Peter Michael Escovedo All-Stars at The District Theater, Gilroy, CA. Latin jazz, funk, and fusion featuring Peter Michael Escovedo – drums and percussion, Pete Escovedo – percussion, Alysha Antonino – vocals, Ray Obiedo – guitar, Marc Van Wageningen – bass and Melecio Magdaluyo – saxes and flute. 7:00 pm. Saturday, August 8 – with Conjunto Karabalí at San Jose Jazz Festival, San Jose, CA. 8:30 – 10:00 pm, on the Salsa Stage. The return of Karabalí, one of the hardest-grooving bands I’ve ever worked with. Led by master percussionists Karl Perazzo (long-time member of the Santana band) and Michael Spiro, Karabalí plays conjunto-style salsa (no timbales), featuring classic repertoire from 70s and 80s New York groups and some burnin’ timba-inflected contemporary Cuban songs. With Santana horns Bill Ortiz – trumpet, and Jeff Cressman – trombone, along with Marty Wehner – trombone, Edgardo Cambon – vocals, and Miguel Martinez – flute. Friday, August 21 – with the Pete Escovedo Latin Jazz Orchestra at Angelica’s Bistro, Redwood City, CA. This is Pete’s powerhouse 10-piece big band. Music starts at 8 pm. Friday, September 18 – with the Escovedo Family at DeVille, Vacaville, CA. Featuring Sheila E, Pete Escovedo, Peter Michael Escovedo, and Juan Escovedo. Music starts at 8 pm. 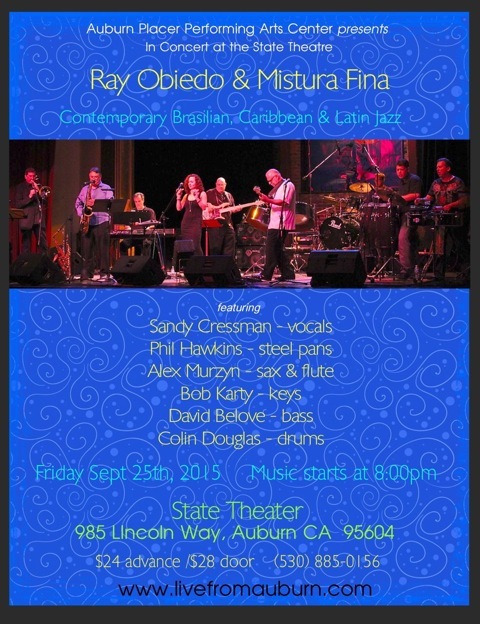 Friday, September 25 – with Ray Obiedo & Mistura Fina, Auburn, CA. Brazilian and Latin jazz mixed with East Bay funk, featuring singer Sandy Cressman. Music starts at 7:30 pm. Friday, November 6 – with the Pete and Juan Escovedo Latin All-Stars at Angelica’s Bistro, Redwood City, CA. With Pete Escovedo – timbales; Juan Escovedo – congas; Ray Obiedo – guitar; David Belove – bass; and Phil Hawkins – drums. Music starts at 8 pm. 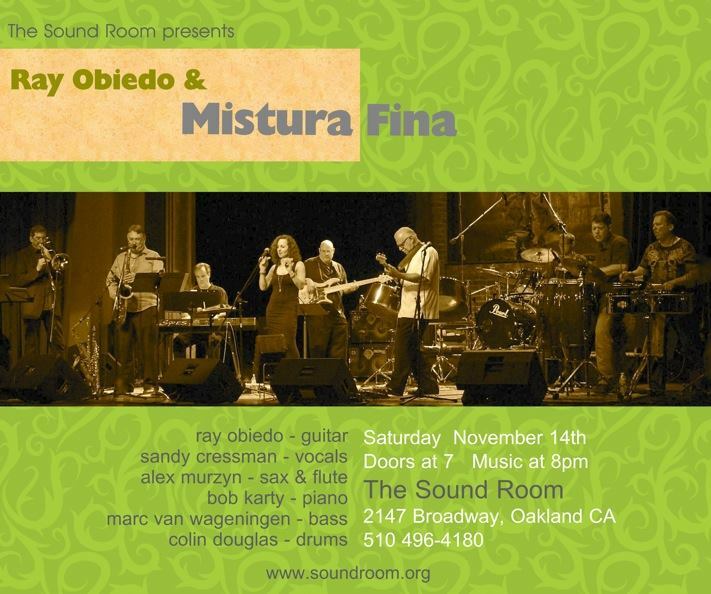 Saturday, November 14 – with Ray Obiedo & Mistura Fina at The Sound Room, 2147 Broadway, Oakland, CA. Brazilian and Latin jazz mixed with East Bay funk featuring singer Sandy Cressman. With Ray Obiedo – guitar, Alex Murzyn – sax & flute, Marc Van Wageningen – bass, and Colin Douglas – drums. Music starts at 8 pm. Sunday, December 13 – with Conjunto Karabalí at The Seahorse, Sausalito, CA. Music starts 5:00 pm. Thursday, December 31 – New Year’s Eve at La Peña, Berkeley, with La Moderna Tradición. Show starts at 9 pm.